What better way to bring family and friends together on a cool evening than gathering around a concrete fire pit? Your space could even include a matching sitting wall. Fire pits and sittng walls have become increasingly popular in recent years. They can transform an otherwise commonplace patio into a cozy backyard retreat. 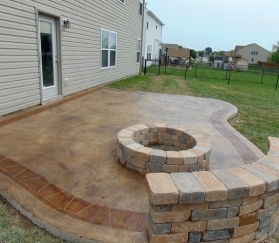 Find a fire pit contractor by clicking here. 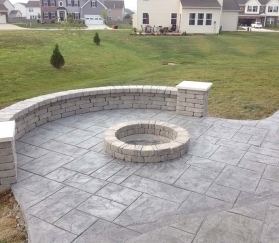 The decorative concrete fire pits and seating walls pictured below were all designed and installed by members of the Indiana Decorative Concrete Network. These Indianapolis area concrete contractors have years of experience installing stamped concrete, stenciled concrete, acid stained concrete, concrete overlayments, and concrete countertops all over Indianapolis, Central Indiana and beyond.